Dirty Foodie Indulgences | We are what we eat! I can’t help it. Sometimes, I just like junk food. Some of my craving is positively white trash, some of it is just doesn’t jive with “foodie” or even “amateur cook”. Last week, while I was holed up in my dark neighborhood bar, hiding in a corner, I realized, I should just share it and let it go. So here it is: my top three dirty foodie confessions. Spicy and wet...sounds like an adult movie. 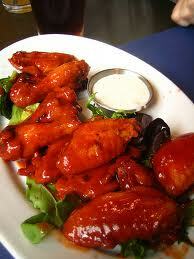 Buffalo Wings: Ohhhhhhh, yes, my hot and spicy companion. I eat you more often than I care to admit. Ordered “hot and wet” with a side of blue cheese, you never fail to make a mockery of neatness or a later calling for the Tums. And yet – I indulge wallow in your messy, crispy goodness. With pride I wear that sauce smudge on my face as I reluctantly clean my hands like a civilized person: with a napkin. Velvetta Grilled Cheese: Though I even won a basket FULL of Wisconsin Cheese (I am a Wisconsin girl always) for my Grilled Cheese Trio…in truth, my dirty secret is Velveeta grilled cheese..often with tomato soup from the can. THE CAN. Oh, what can I say, Velvetta’s gooey warmth reminds me of childhood and is much easier to bring home than my Mom. As for tomato soup in the can, I beg no pardon. I did, however, recently discover that tomato soup in the BOX is even better than the can. See? Old dogs can learn new tricks. 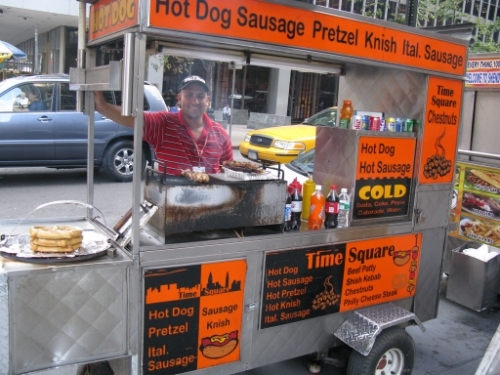 Anything out of a cart, truck, shack or trailor: I loved this kind of food before it came out of the ghetto and into Orange County. Seriously, I got a taste for it buying tacos and ice cream from a man with a cart when my start-up business WAS in the ghetto and across from the jail. I also love a good hot dog right off the street – you know the kind where you wonder how long its been simmering in that opaque water. “Consider it an adventure with mustard,” that’s what I say! At Oahu’s North Shore, I sneak off to Romy’s for Prawns and Garlic, surrounded by hot sweaty mix of tourists and surfers. I don’t even care that I wait 45 minutes AFTER my 45 minute wait to order. Street food just rocks. Beach food rocks too. C’mon. Tell me yours. Use a pseudonym if you have too, but consider this blog your foodie confessional…whose first?! Have to admit that three of my favorite ‘take me back to childhood’ lowbrow indulgences are chips and dip, bologna sandwiches and corn dogs at the State Fair. 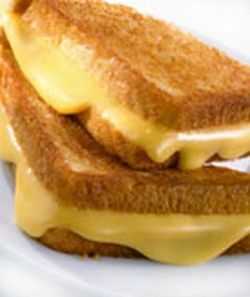 I am SO craving a velveeta grilled cheese right now! OOOH and Buffalo wings! Oh how I long for the days when I didn’t know how bad those things were for me…. Hello luv, hoping you are all well and enjoyed a beautiful summer. Just wanted to let you know that I reallllllllyyyy enjoyed this post. I have all of them currently on my mind to eat along with a nice thick slice of Botchcci’s Pizza (Buffalo New York) Double cheese please! Dear Tara – I LOVE your dirty foodie secrets – here’s mine! 1) Street foods rock – those served over a wooden plank spanning a filthy gutter, taste even better! @Devaki – I can’t BELIEVE I left out SPAM! @Mia – you know…that’s the point with junk food..sometimes you have to indulge. @Abigail – bologna sandwiches! Yes! That’s a winner too!